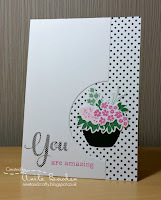 I have been trying to get my card finished all week for the challenge over at Muse. Sometimes you see a card and you think wow love that ! Anitas Muse card this week was one of those but couldn't think how to do one that wasn't a straight case ! So decided to go with the dotty background and you will note Michele that I have used dotty DP ( well DP in my case really stands for a digi paper pink petticoats to be precise! )- found it when I was looking for that flowery one.Backed it in black and cut out a circle to mimic Anitas layout. Then took the colours of her flowers and finally added a sentiment with roughly the same meaning ..don't seem to have an amazing one. Sorry about the photograph thought the layout looked better as a landscape card but I haven't yet worked out how to get a good photograph of that yet,will try again tomorrow ...but you get the idea I hope! Hola Jenni. I love your card for Muse, fantastic interpretation about the card of Anita.Beautiful card!!! Love this - I had given thought to having one black dot on my card, but then those fab dotty circle dies arrived in my mailbox, so I went another direction. I love how our minds often work in similar ways! So glad you joined us at Muse this week, Jenni! It's obvious how your card started with Anita's MUSE card and then you adapted it, skillfully, to make it your own card! Masterful and beautiful. Beautiful interpretation of my card, Jenni. I love how crisp, clean and sophisticated this is, I've got a 'stash' of Pink Petticoat hiding in my laptop too! Jenni, your interpretation of Anita's card is spot on ... I like that you made your card that is perfect for you.